Korea’s first film project to be conceived as a franchise from the beginning, the two-part feature Along with the Gods was simultaneously shot to be released over two years. 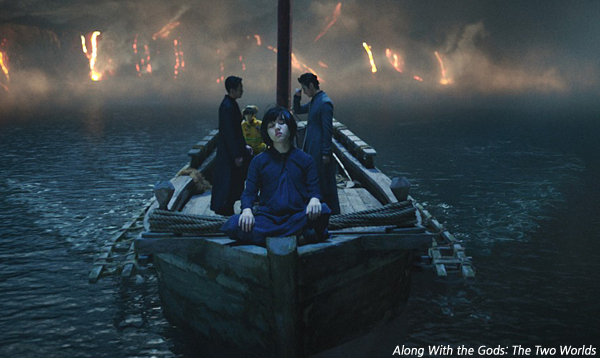 The first film, Along with the Gods: The Two Worlds, will hit screens this winter before the second title, Along with the Gods: The Last 49 Days, is released in summer 2018. Based on the smash-hit “webtoon” (comic strips published online) of the same name, the fantasy film follows the afterlife journey of Ja-hong, a firefighter who dies unexpectedly. Three “afterlife guardians” guide him to the underworld. In order to reincarnate, he must pass seven trials over a period of 49 days to prove that he has led an innocent human life. The serial made headlines for bringing together an A-list cast including HA Jung-woo (Tunnel, 2016), CHA Tae-hyun (Slow Video, 2014) and JU Ji-hoon (Asura : The City of Madness).